NTH reviewed Phase One Environmental Site Assessment and Hazardous Materials Survey report and performed a visual survey comparing the reports to the site conditions. Our services for the proposed HMS verification and update included evaluation of asbestos-containing materials (ACM), lead-based paint (LBP), cadmiumbased paint (CBP) and other hazardous materials/stored chemicals within the building. This purpose of this task was to supplement and verify the information presented in ASTI’s reports. An updated table of friable and non-friable homogeneous areas identified as containing asbestos. The table will also include quantities (as determined by ASTI) and locations of each homogeneous area identified as containing asbestos. Laboratory results of additional bulk samples collected by NTH and analyzed for asbestos. A table of painted surface areas identified as LBP and CBP through paint chip testing along with the locations and condition of the sampled areas. ASTI’s table of stored chemicals and hazardous materials present in the building. 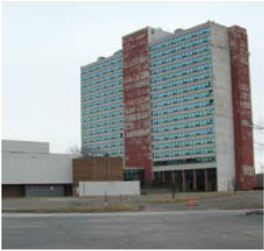 NTH prepared technical specifications for the demolition of the building, as well as for removal of asbestos-containing materials (ACM) and other hazardous materials. Drawings were also developed outlining Southfield-owned utilities such as water and sewer showing limits of removal. NTH included standard details associated with utility capping, abandonment and relocation. After the bids were advertised to the prequalified bidders, NTH conducted a mandatory “contractor walk-through” and responded to contractor inquiries during the bidding process. NTH performed air monitoring and project oversight during asbestos abatement and hazardous materials removal activities. Asbestos abatement and hazardous materials remediation was performed by National Environmental Group. Observed hazardous materials removal practices and procedures carried out by the abatement contractor and its workers for compliance with federal, state, and local laws and regulations, as well as compliance with the project specifications. Air sampling and analysis for asbestos before and during the abatement work. Visual clearance upon completion of asbestos abatement activities, followed by the final air clearance monitoring. With NTH assistance, removal of these materials was completed with no significant difficulties and within applicable regulations.